We have a new selection of Hand Embroidery Kits to share with you today. They're Embroidery Wall Art Kits from Penguin & Fish. 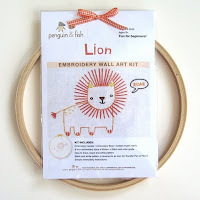 You'll find six adorable animal-themed embroidery patterns in the line-up, including a lion, owl, monkey, elephant, fox, and hedgehog. I love the creative simplicity of these embroidery kits - easy to embroider designs, all the materials you need to complete the project, and step-by-step instructions for beginners. And, with everything being so nicely packaged, it makes a great gift giving idea. 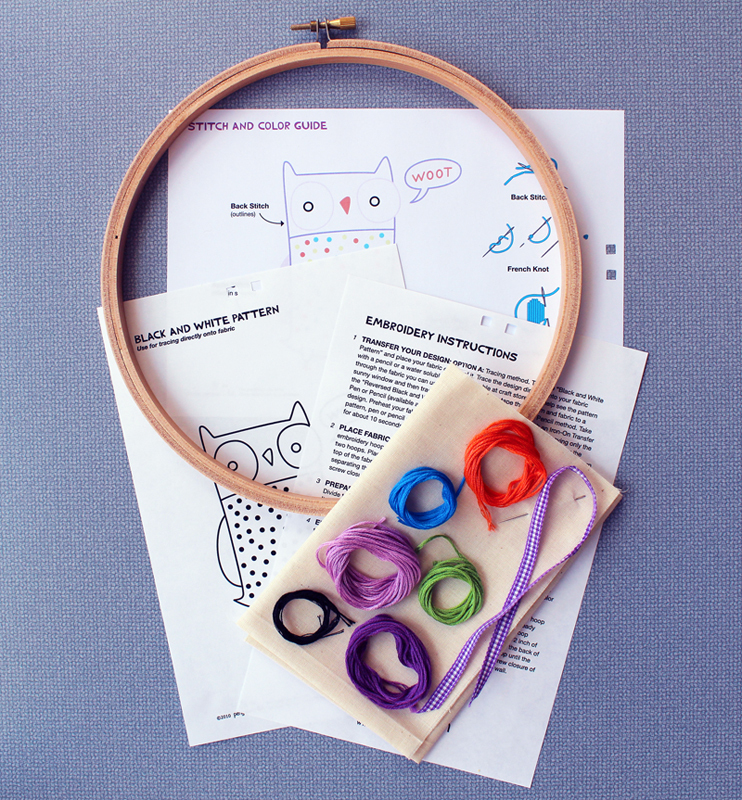 I couldn't resist opening one up, so I decided that I would create the Owl Embroidery Wall Art Kit and present it here as a Craft Kit Preview and embroidery tutorial. Give you a closer look at the kit, with more details & explanation than the product description. 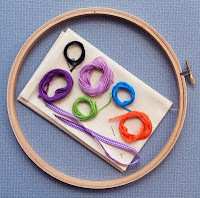 Offer helpful embroidery tips & suggestions, especially for beginners just getting started. 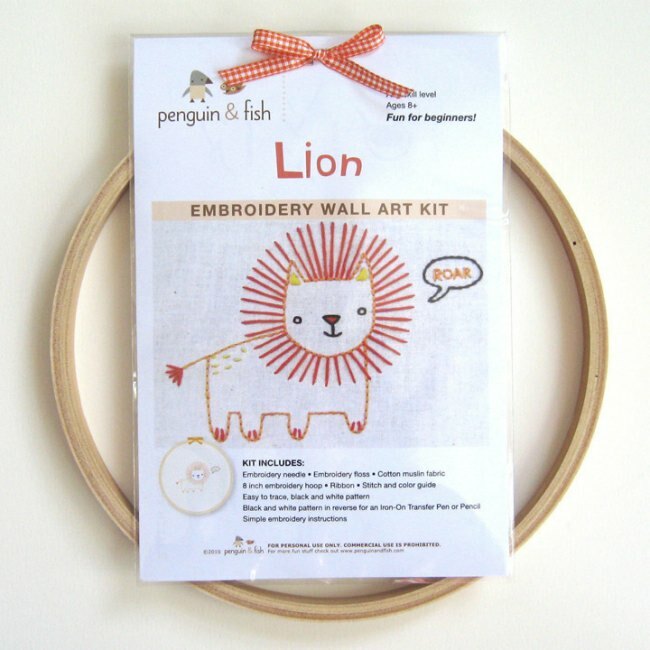 Show you how easy it is to create embroidery wall art with these creative & fun kits! This kit includes materials, supplies, and instructions for completing the embroidery project. I was impressed with the completeness of the kit and quality of the materials provided. The only additional supplies you need to have on hand for this project are a transfer pen or pencil, a pair of scissors, and some white craft glue for finishing. The first task to accomplish is transferring the embroidery design onto the fabric. The instructions offer two options. The first option, and the one I recommend for beginners, is to use the black & white pattern to trace the design directly onto the fabric using a pencil or water soluble pen. The second option is to create an iron-on transfer by drawing over the lines of the reverse image pattern using an iron-on transfer pen. After trying both options myself, I personally preferred using the water soluble pen for this embroidery design. The following are my key takeaways for the 2 design transfer options. I used a water soluble embroidery transfer pen to trace the design. The black & white pattern was clearly visible through the muslin fabric even without a light source and I found it easy to control the flow of ink from the transfer pen as I was tracing the lines onto the fabric. The lines from the transfer pen were thin enough that I was confident they would be easily covered by the embroidery stitches. The big advantage in my mind is that the pen is water soluble, so it's easy to remove any mistakes using a damp cloth. It put me at ease knowing that it would be easy to recover if I drew outside the line or made the line too bold. I also knew that I would be able to remove any excess markings later on if my stitches didn't completely cover them. I used an iron-on transfer pen with blue ink to draw over the lines of the reverse image pattern. An important note if you're trying this method for the first time is to be sure to make some extra copies of the reverse image pattern. I was glad that I did. It takes some time to get used to how the ink flows from the pen and if you make a mistake, the permanent ink will be transferred to the fabric. I suggest ironing on practice fabric first to be sure you're happy with the transfer. I decided that the lines created with the iron-on transfer pen were thicker than I wanted for this design and that it would be difficult to completely cover them with the line of embroidery stitches. My conclusion from using the iron-on transfer pen is that it would be a viable option for applications where you know the transfer lines will be completely covered by your work, but that it was not a good fit for this project, where they need to be covered with a single line of embroidery stitches. In summary, after trying both methods, I recommend Option 1 as an easy & low risk method for beginners to transfer the embroidery design onto the fabric. Beginners will appreciate the step-by-step embroidery instructions. 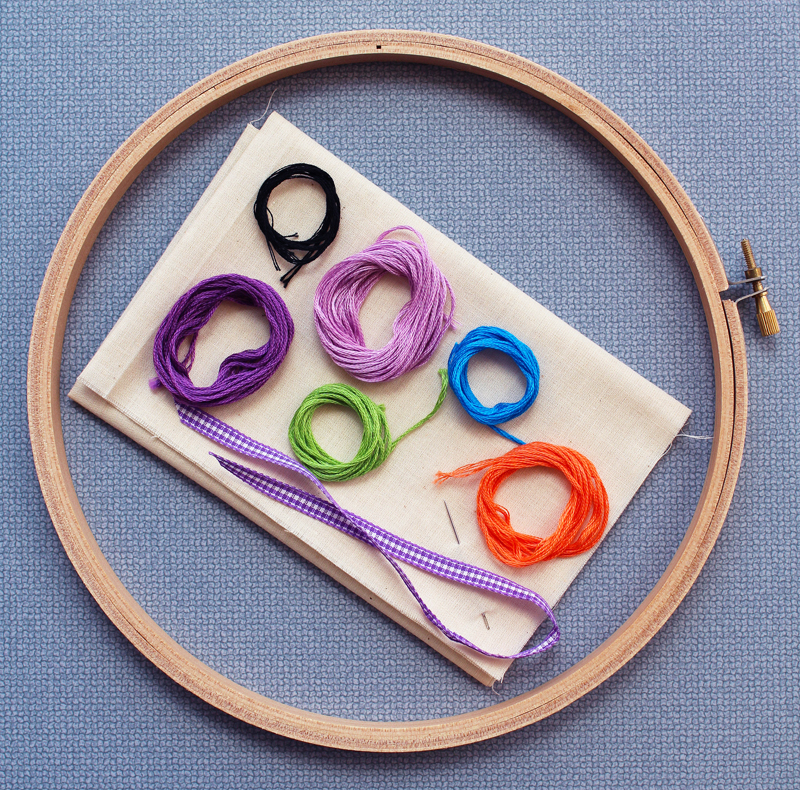 You'll learn how to place the fabric in the hoop and prepare the floss for stitching. The thread is 6-strand floss, so it needs to be separated out into individual strands and then recombined into 3-strand pieces. Generous amounts of floss are included, so I suggest preparing the floss "as you go" rather than all at once. This way you won't spend too much time preparing more than you need for the project. And, you can save any extra floss for future craft projects. Simple designs & basic embroidery stitches are used for these kits. 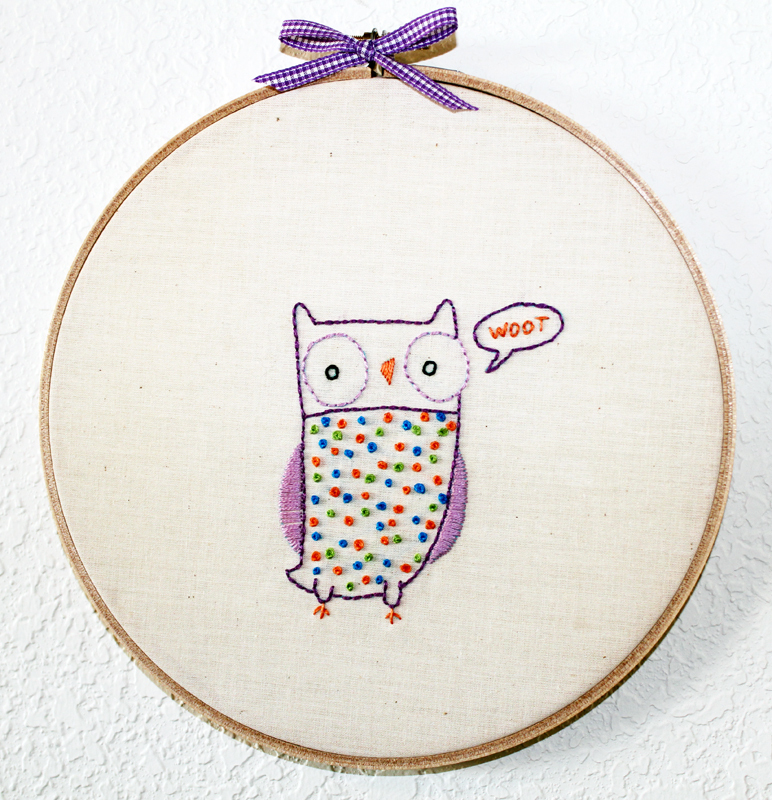 The Owl design that I made uses the back stitch, satin stitch, and lots of french knots. The Stitch & Color Guide provides basic stitch diagrams and shows where to place the stitches & thread colors on the design. You choose a place to begin and start embroidering. The key at this point in the project is to just have fun with the design and not worry so much about making perfect stitches. Often times, "mistakes" add character and uniqueness, enhancing the final result. Remember, it's handmade, so you really don't want it to be perfect! If you're interested in finding a good how-to embroidery resource, the How To Embroider handbook from The National NeedleArts Association is an excellent reference for beginners. Basic embroidery techniques are covered with clearly written instructions, easy-to-follow diagrams, and illustrations. After finishing all the embroidery work, you'll be ready to prepare your needle art for display. I followed the instructions included in the kit for turning the embroidery hoop into a creative frame. The decorative ribbon adds a nice finishing accent and is the final step of the project. 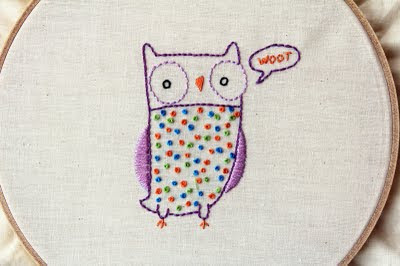 I made the owl embroidery wall art for my daughter and she loves it! 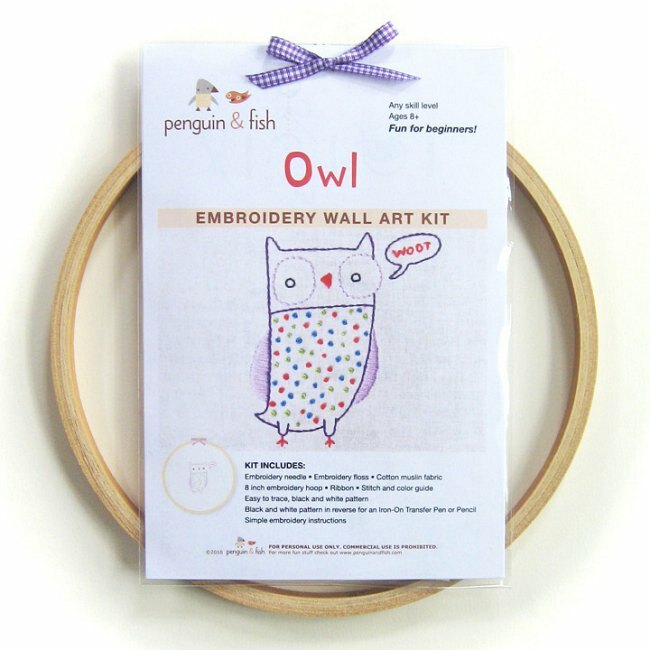 The embroidery wall art kits from Penguin & Fish are an ideal embroidery kit for beginners & fun for all skill levels! The simple nature of the designs makes it easy to relax, embroider, and be creative. 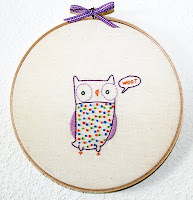 I enjoyed creating the Owl Wall Art Embroidery Kit and hope that my experience is helpful to you if you decide to make one too. These kits are recommended for adults & children ages 8 and up. Younger kids will benefit from adult guidance as they move through the project steps. Visit the Embroidery Kits section to see other embroidery designs and to see our complete selection of embroidery kits, including hand embroidery kits, crewel embroidery kits, cross stitch kits, and more! Weekend Kits offers a unique selection of modern DIY Craft Kits across a variety of crafting categories. Kits make it easy, convenient, and most of all FUN to learn & create something new. Be ready to start a new craft project on your next Weekend at Home. Thanks for visiting the Weekend Kits Blog! Jewelry Making Kit Giveaway at Weekend Kits! The April Craft Kit Giveaway has ended - be sure to check back for future giveaways. The winner of the April Craft Kit Giveaway is Pam's Latest. Congratulations Pam! Please Contact Us with your shipping information and we'll have your prize out to you right away. Thanks to everyone who entered the giveaway and joined us on our new Facebook page. Please stop by now & then for information on new product arrivals, promotions, and to hear about our next Craft Kit Giveaway! I'm looking forward to meeting you there. I'm excited to tell you about our first Craft Kit Giveaway at Weekend Kits! You can enter to win one of the new Jewelry Class is a Box! Kits from Cousin. This is a great jewelry making kit for beginners, with everything you need to start making your own jewelry at home. 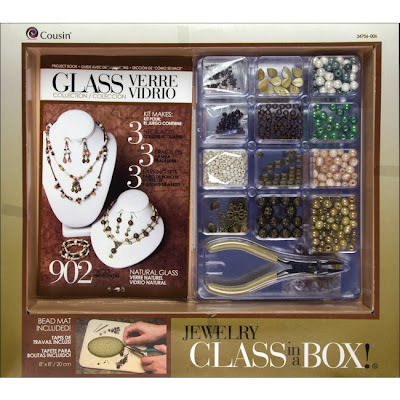 One winner will be randomly selected to win the Natural Glass Collection - Jewelry Class in a Box! This amazing kit includes a 3-in-1 jewelry making tool, bead mat, beads, charms, and other jewelry findings. An instruction booklet gives step-by-step guidance for making 3 necklaces, 3 bracelets, and 3 earring sets! • Jump on over to our brand new Weekend Kits Facebook Page and press the Like button at the top of the page. • Leave a comment right here on this blog post letting us know that you Like Weekend Kits now. That's it. Follow these 2 Easy Steps & you'll be entered to win! • You have until Sunday, April 17 at 10:00pm (PDT) to enter. • One winner will be chosen at random. Only one entry per person. • You must be 18 years or older to enter. • Open to US shipping addresses only. The winner will be announced here on Monday, April 18. Please be sure to check back to see if it's you! 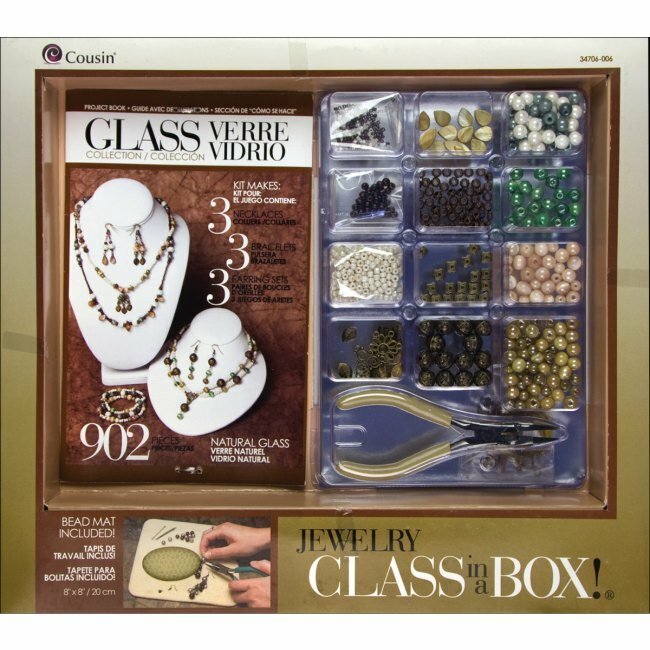 If you've ever wanted to learn how to make your own jewelry - this is the perfect kit to get you started. Get ready to start making jewelry on your next Weekend at Home. Good Luck Crafters!